Mimosa Books & Gifts services the Madison, Wisconsin area with their retail store and a worldwide customer base with their online store. The old site was over a decade old with an aging eCommerce solution that desperately needed a revamp. 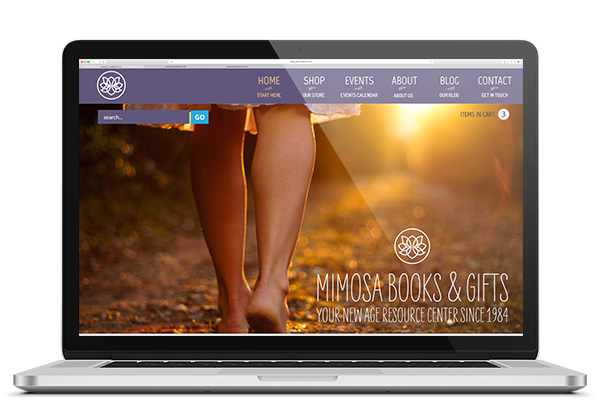 In addition, Mimosa wanted to consolidate their blogging, events and store onto one site. Going in, I modernized the design of the website and grouped its three components into one easy to maintain system. Mimosa’s website now boasts a modern eCommerce system, easy CMS and a speedy, reliable hosting environment. They handle their own updates and can more efficiently interact with their customer base. 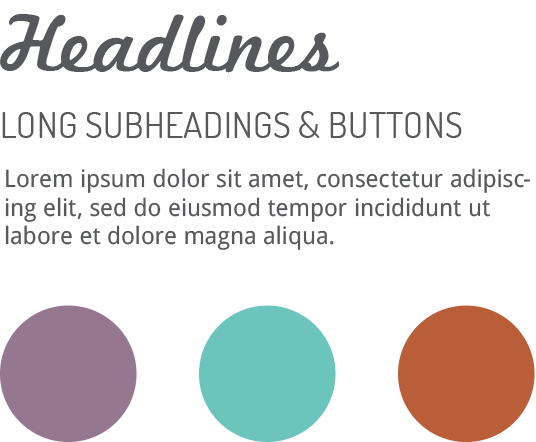 I wanted to ensure that Mimosa had a large, usable homepage to maximize the frontpage traffic. It was interesting working on a half-community and half-eCommerce store as both sections needed equal attention. I initially went with a vibrant color scheme that was knocked back in the finalized version with a more toned down variant and some components moved around to focus less on the online store and more on the community aspects of the website. Mimosa was established in 1984 and began as a community bookstore. They have since grown and adapted and service their customers by offering more than just a great selection of books. I wanted to make sure every aspect of their community services and events was covered because Mimosa is more than just books, their community outreach and events were important too. 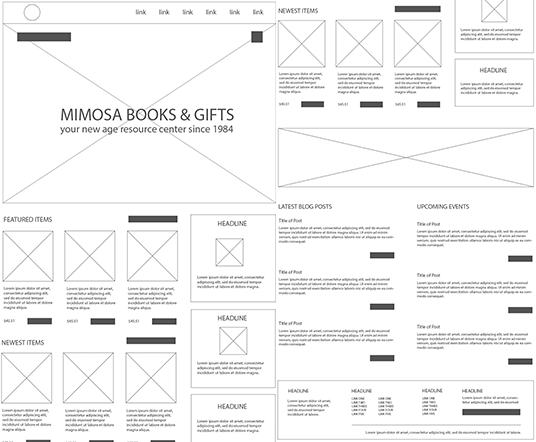 You’ll see some of the planning components along with one of the many wireframes that inspired the finalized design. 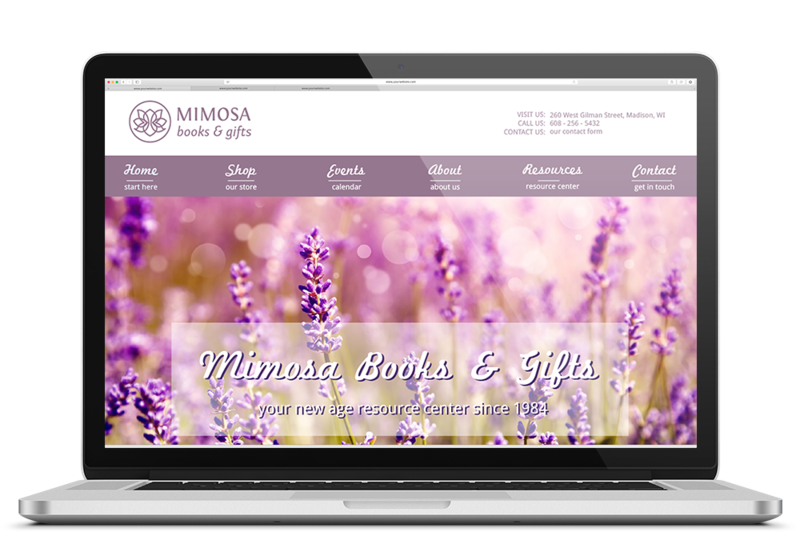 Mimosa’s new website and eCommerce system was deployed in 2013 on a brand new host with a shiny new look. The staff maintains and updates the website themselves and boasts up to 300% in increased sales since the new website’s deployment. Way to go, Mimosa!